Rogue Women Writers: Going to Moscow ... Want to come along? What a wonderful question. But my head reeled. How do I choose? 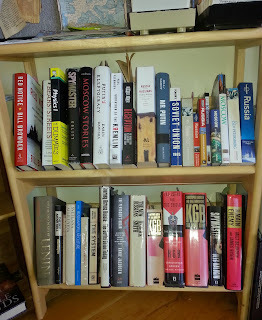 And then, how do I explain about the wealth of books, magazine articles, online articles, and intelligence-gathering sources I use that’ll answer your questions and feed your curiosity for more answers? Plus of course there are human sources — humint — men and women in the intelligence field or retired from it who are generous with their insights and observations. All of this available in one book? 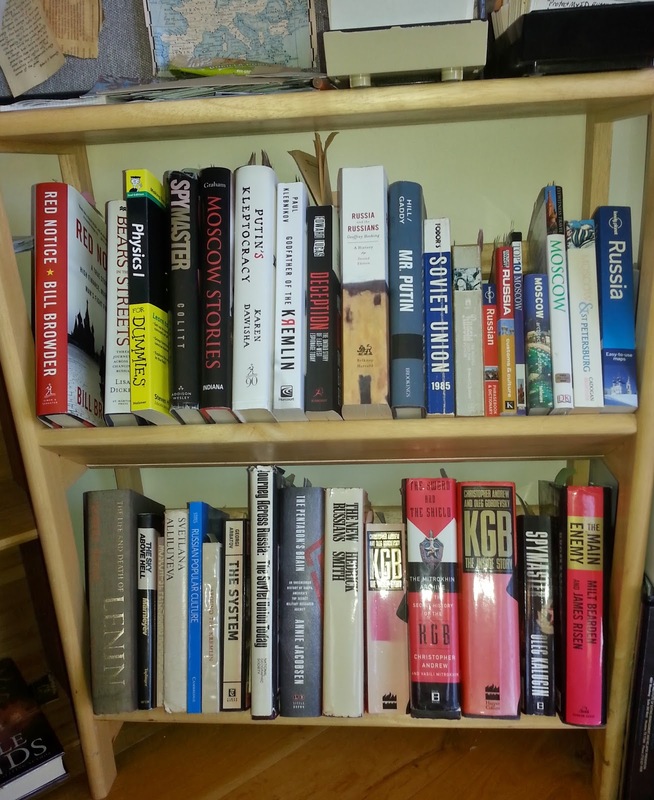 Books & other research on espionage, in my office. 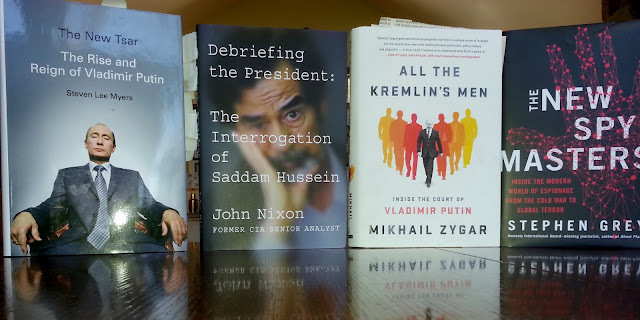 For me, writing about the spy field is a lifestyle, a constant intake of information, finding one nugget and pursuing it as it dies a natural death or explodes into more nuggets. My only problem is knowing when to stop. The spy novel on which I’m working is set largely in Moscow, and I’m fascinated by the culture, the beauty, the depravity, the generosity. I need to know about that and more.... Sights, odors, colors. People. Spassky Gate. The bridges illuminated by twinkling lights. Busy Komsomol Square where three rail terminals converge and a tall statue of Lenin stands nearby, watching as he holds the lapel of his coat with one hand while the other reaches for a back pocket. Lenin appears to have just realized his wallet has been swiped. That’s Komsomol Square. Oligarchs at a swank nightclub: “New arrivals were greeted by women who were beautiful on a surreal level. The interior design was out of Somerset Maugham, all dark woods and lazy ceiling fans. Here a man could sip Johnnie Walker Blue, light a Cuban cigar, sip a brandy, unwind, and make more money.” — “Moscow Never Sleeps” by Martin Cruz Smith, National Geographic. All of the above play roles in my new spy novel, plus of course the machinations of the FSB, the Kremlin, dissidents, apologists, old Communists, new democrats, the ordinary citizen just trying to get by. They’re the heaving, striving, boisterous testament to a city fueled by ambition and guaranteed never to be boring. So in answer to my friend’s question of one book to fill out the details of espionage, how can I choose? Instead, let’s all go to Moscow and find out for ourselves. Guaranteed, we won't be bored. With this post I begin the next round of Rogue offerings that ask the timeless question: If you could go anywhere and do anything, where and what would it be? Gayle-I'm ready!!! Especially in light of what is happening in our own country!! Let's go!! I know, Debi, it's really something. O, to be a mouse in the corner of Putin's office. Wonderful post. Especially useful since I'm also writing about Russia. I do have to admit that I'd prefer to discover Russia from books right now. Ah, that element of danger. Yep, you're right, S. Lee Manning. Still ... I really wanna go, but won't, at least not now. For one thing, I'm no longer jazzed by flying. It's all such a pain now. What scares me about flying to Moscow is writing Spy fiction. "What brings you to Moscow from America?" "Oh just writing a Spy novel." and how easy will it be to get back in to America if they assist with such writings... Lol Thank you for this awesome list of books and your amazing knowledge. You rock. I'd like to see the Grand Canyon, followed by the giant sequoias. A friend of mine told me seeing the Grand Canyon is a "religious experience," and the sequoias . . . well, I won't know till I see them. It's crazy, isn't it, Sonja! Too many books at a time, but my brain just keeps jumping around and wanting more, more, more. I love the ambulance stopping to pick up a fare, too, and in fact my heroine is a Moscow gypsy cab driver! I've been to Moscow five times and found it fascinating. Although I want to return to St. Petersburg (called Leningrad when I was there in the 60s), I don't need to see Moscow again. A dear friend who was born there and now lives in Houston says she no longer recognizes her beloved city and doesn't enjoy it. Oligarchs and thugs rule. 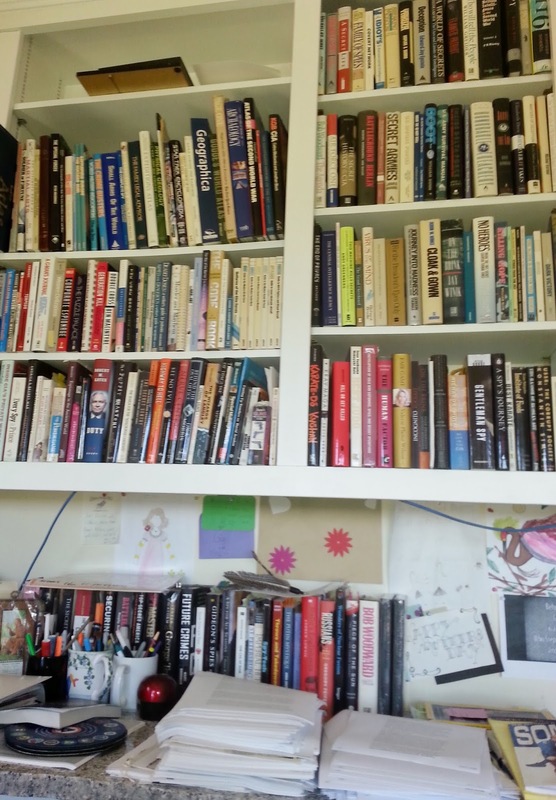 Gayle, I loved this post and the books you recommend. Let's all run off to St. Petersburg. It feels so different from Moscow, and my pal Irina still loves it. But I don't want to take her word for it. I want to check it out and see all its beauty and culture again. Thank you, Kay! And definitely I'd love to visit St. Petersburg, too. I study it and salivate. What a marvelous and interesting life you've led! 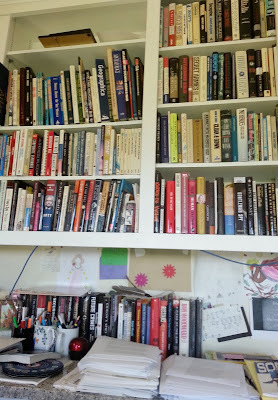 Gayle, what a wonderful post with a great list of books as terrific resources. It made me recall another novel, RED SPARROW, by Jason Matthews who worked in the CIA for over 30 years -- a specialist on Russia - also a member of our International Thriller Writers organization who won the award for best first novel with that one. Now I wish I could travel to Moscow again, but this time with you as you gather "intel" for what I know will be a most intriguing next thriller! Keep us posted on this great trip! I wish you could come along, too, Karna. We would have fun & learn a lot! Funny, I read like this, too--multiple books all at the same time. I'm currently trying to talk my husband into a trip that includes a two day stop in St. Petersburg. I've decided I'm going to just make the plans, and let the chips fall where they may. Last time we considered a cruise, one of the stops was Egypt, during the 2013 coup. Bad timing. The stop was cancelled by the cruise line, so we didn't go.